Just days after Robert Mugabe won yet another rigged election in Zimbabwe, “Breakfast with Mugabe” made its New York City premiere on August 7th, presenting a moving fictional portrayal of the country’s volatile political state. The screenplay by Fraser Grace and the ensemble cast of four effectively captured the inner turmoil that consumed President Mugabe and rippled throughout Zimbabwe. The story is set in 2001, when the Mugabe government infamously began its program of Fast-Track Land Reform, violently forcing white landowners off their land. It was during this time that Mugabe was purportedly seeing a white psychiatrist, providing the impetus for this production. In the play, Dr. Andrew Peric is a white Zimbabwean of national prestige: a psychiatrist trained by Western methods with a keen knowledge of Shona spirituality. Mugabe seeks Peric's help as he is suffering from anxiety caused by the ngozi, or malevolent spirit, of a late comrade from the War of Liberation. Peric soon discovers that anxiety is not Mugabe’s only psychological problem; he also suffers from a bloated ego, perhaps even a messiah complex. A constant struggle takes place between Peric and Mugabe as each vies for authority in their professional relationship. Grace, Mugabe's sassy and self-assured wife, joins the power struggle by pleading with Peric to have Mugabe loosen his stranglehold over her. Peric, the incessantly estimable doctor played by Ezra Barnes, is undoubtedly the star of the show. He starts off as an earnest professional intent on helping his client unravel the past in order to move forward. In the face of repeated offers from both Mugabe and Grace, he maintains that no bribe will change his course. Mugabe begrudgingly cooperates with Peric's psychoanalysis until he is pushed far beyond his comfort level; the exhumation of his past only fuels Muagbe’s vengeful rage. In the end, it is Peric who is haunted by an ngozi. Like Oliver Stone's “W”, “Breakfast with Mugabe” paints a somewhat sympathetic portrait of a psychologically troubled and notorious president, and even does so with humor. The shrewd Che Ayende consistently provides comic relief as the loyal, self-serving guard of the Mugabe household. 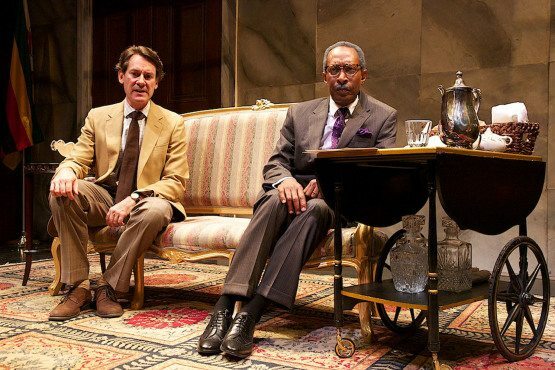 Michael Rogers manifests the delusional and senile egotism of Mugabe's character in every scene, and Rosalyn Coleman is painfully convincing as his wily young wife. “Breakfast with Mugabe” is not only a compelling and entertaining drama; it is also a decent representation of Zimbabwe's history. The themes of corruption, haunting spirits, and lost hope are as prevalent in the young country's 33-year history as they are in this play. While it may run a bit long, “Breakfast with Mugabe” culminates in a disturbing and powerful ending that does justice to the history it’s based on. Melinda Tenenzapf is a filmmaker, comic, and writer from Brooklyn, NY.